Product prices and availability are accurate as of 2019-04-23 06:18:35 CDT and are subject to change. Any price and availability information displayed on http://www.amazon.com/ at the time of purchase will apply to the purchase of this product. 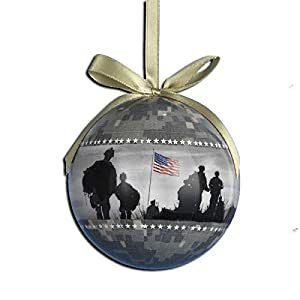 US Army Ornament . Decoupage ornament by Kurt Adler . Approximately 3 inches in diameter (80mm) . Licensed US Army product. Kurt S Adler Beautiful Patriotic Ornament Makes a great gift Comes with ribbon for hanging Show your U.S. Pride!